You might have seen yesterday’s long-form piece on the transformation of Mount Vernon Triangle, a neighborhood making the transition from parking lots and empty lots to being a vibrant part of the fabric of the city. You should read the whole piece if you haven’t. But I want to talk about this excerpt from Marvin Joseph’s photo of construction in the area. 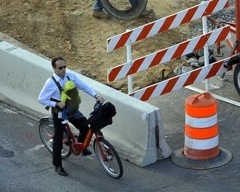 The full photo, available here, is a picture of construction along K Street between 3rd & 7th Streets NW, but it features this dad and child on Bikeshare. Now, I’m no believer in sheltered youth, I’m going to be the sort of parent that sends Johnny and Janie out to play outside as much as possible, and when they get boo-boos, there will be requisite fawning over their injuries – but also praise and reward, for risk-taking can be a valuable skill. However, I’m not sure that strapping your newborn to your chest, and hopping on a Bikeshare bike (sans-helmet, natch) is a great way to go through life. But maybe that’s just me. What do you think? REI has a good guide to biking with your kids, so try that before you hit up Bikeshare with the Baby Björn. Yeah, I’m kinda torn on this one (and yes, I do have a child). Bottom line is that this probably isn’t any more dangerous than any other approach to biking with babies. yeah, i don’t see how this is any less acceptable than strapping the kid into a baby seat on the bike – looks like the baby is wearing a little helmet. really only the dad is being unsafe by not wearing one. worry more about what is most likely to kill these two — cars. As a parent who bikes with my kids, this is pretty terrifying to me. For so many reasons. An infant of that size cannot hold his or her head sufficiently stable to ride safely on a bike like this. Indeed, unless you’re riding a front-loader flat bed bike with a secured infant seat, or MAYBE a trailer with an infant seat inside, one should wait until a child is at least 9 months to take them on a bike in a child seat (pediatricians probably say 12 months), and only if they have a strong enough neck. I could go on and on, but to really learn about safe family biking, come on down on Saturday to the ABCs of Family Biking event! organized by Kidical Mass DC wit the help of both WABA and DDOT – http://kidicalmassdc.blogspot.com/p/abcs-of-family-biking.html We will have loads of examples of different kinds of bikes that ARE SAFE for riding with kids! Oh, and that kid definitely is NOT wearing a helmet. How about worrying about the car drivers constantly on their “smart” phones instead of wasting time on a loving dad taking care of his baby? And is it really the safety of the child that’s bothering you or the nonconformist situation? Nonconformist? The baby and the father should, at the very least, be wearing helmets. After watching a friend get a concussion from not wearing one, I always do. And an infant is too young to bring on a bike! Especially strapped to your chest. If he falls off the bike, he’s going to land on his child, probably killing it. I actually saw another guy riding a bike like this – maybe it’s the same person. But it is super important to be noncormist safely. Yes, my biggest fear on the road is stupid drivers. But stupid drivers are EXACTLY why I wouldn’t do this with a baby. I think people spend WAY too much time pointing out the problems they see with others. If everyone self reflected a bit more often, maybe life would be a little more pleasant. There is nothing more annoying than parents “parenting” for others. I’m just glad the guy is out and about and NOT sitting on his couch teaching his kid the art of laziness. Strom, seriously? Would you be saying the same thing if you saw a dad driving on the highway with a two year old bouncing on the front seat without a car seat or seatbelt, would you say the same thing? How about someone who let their 4 year old play in a busy street? There are some rules to parenting that are accepted, including the fact that parents’ first and most important job is to keep their kids safe from harm. This doesn’t doesn’t cut it. And seriously, sitting on the couch vs. comatose for the rest of your child’s life? I don’t really think there’s a question here.